Safety Hazards are described as items that may constitute a present and imminent serious safety hazard. 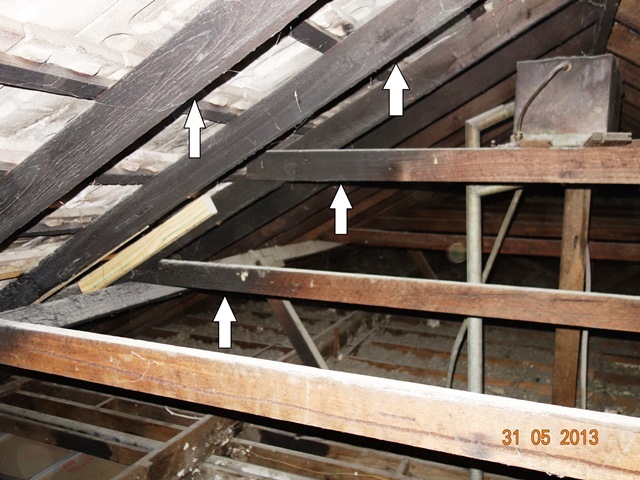 Obvious defects of this type commonly seen during out house inspections are decayed decking joists or balustrade that if someone was to lean heavily on may collapse. See below for photos of safety hazards commonly seen during our building inspections. The above photograph was taken by Mr Inspector, a qualified building inspector in Melbourne (Diploma Building Surveying) who assists home buyers and owners with extremely detailed defects inspection reports, for use either before they purchase a home or for those preparing to sell their homes. Part of a pre-purchase building inspection in Melbourne involves inspecting the home for Safety Hazards and reporting on each individual hazard and recommending rectification methods. The photograph above was taken during a building inspection in Elwood and depicts a chimney that has been blocked. This is OK if you know it is blocked but for the unsuspecting home buyers who comes in a lights a fire it could cause excess smoke damage internally or the cover to ignite and cause an external fire. Some homes have had the chimney's removed from the ceiling upward but left the fireplace intact - this is a extreme hazard if one does not know about it. Lighting a fire in this circumstances could easily cause a roof fire and we have seen many fire damaged roof frames during our building inspections in Melbourne. If you require advice or assistance from a qualified house inspector in Melbourne, please call us and we will be able to assist. Mr Inspector, a qualified Building Inspector conducts professional pre-purchase Building and Pest Inspections in the Black Rock area and surrounds. The above photograph was taken by Mr Inspector during one of his many building inspections in Black Rock. The house inspection photograph depicts fire damage to the timber framing members which would not be picked up unless a thorough building and pest inspection was carried out. Some areas have been repaired but ultimately all the fire affected timbers should have been replaced due to the structural integrity of the timber being compromised. This signifies why it is so important to have your potential home inspected because you would not get access to the roof space during the "open for inspection" times that you may attend. The estimated rectification cost for this defect was $18,000. This is a very good reason why it is so important to obtain the services of a qualified and experienced building inspector. Mr Inspector has been doing building inspections Melbourne wide since 2004 and is is the only qualified Building Inspector (Diploma of Building Surveying) operating from the Cheltenham, Black Rock, Sandringham, Hampton, Beaumaris and Mentone areas. The above photograph was taken by Mr Inspectors's qualified building inspectors during a house inspection in Parkdale. It is depicting a party wall dividing two dwellings that has gapping on the top that would allow the spread of fire. These walls must be fire proofed with a non-combustible material to prevent spread of fire from travelling from one dwelling to another. This is a potential safety hazard and a qualified carpenter should be engaged to assess and rectify. This photograph shows exactly why a building inspection before you purchase a home is essential from a safety perspective. Mr Inspector is a qualified building inspector in Bayside, Cheltenham and took the above photograph during a building inspection in Beaumaris. This photograph depicts the fascia detached from the home where the mains power is connected. This is a serious safety hazard if the fascia completely breaks away leaving mains power hanging in the street and yard. The electricity supplier will need to be contacted to repair at the owners cost. The house inspection revealed that this had been like this for over 12 months and the owner had not even noticed it. Mr Inspector is Melbourne's leading qualified building inspectors and took this is a photograph from the roof of a building inspection in St Kilda. It is showing a view from the house roof into the adjoining property and evidence of the a recent damaging fire. The result was structural damage to the homes party wall. This is compelling evidence of the importance of a thorough building inspection from a qualified building inspector such as Mr Inspector. Mr Inspector, a qualified Building Inspector in Melbourne took this photograph taken during a building inspection in Cheltenham which shows a significantly poor deck footings construction that is a safety hazard due to possible collapse as the footings were inadequate and non-compliant with Building Code of Australia. A carpenter had to be engaged and all stump footings removed and adequately replaced. Mr Inspector inspects all raised areas during the building inspection process including inspecting verandas, pergolas, balustrade safety requirements, decking frames and fencing. These types of defects are commonly picked up during Mr Inspectors House Inspections and are structural defects which are quite costly to rectify. It is important to have any home inspected by a qualified building inspector before your purchase. Mr Inspector, a qualified building inspector in Melbourne took these photographs at a building inspection in Frankston which shows loose or hanging wiring in the sub floor inspection. This building inspection defect is often seen in the sub floor area of older homes we inspect. Normally related to poor workmanship and can be a safety hazard if the wiring is live. Mr Inspector tests loose wiring to ascertain if this is live or not and you will need to get a licensed electrician to make minor repairs to deem safe. This signifies the importance of having a qualified building inspector assess your home before you purchase. Mr Inspector is a qualified building inspector and pest inspector in Melbourne who has been conducting professional building and pest inspection Melbourne wide since 2004. Many house inspections in Melbourne reveal that the roof insulation is too close to, or covering down lights. During past building inspections we have seen roof frames that at some stage have had a fire through them. Insulation to close to down lights can be a fire hazard and covers must be placed over them or insulation pulled away. Also consider, new LED lighting does not heat up as hot as halogen down lights and are far more economical on your power bills. The above photograph was taken by Mr Inspector during a building inspection in Highett and shows debris and insulation surrounding the down light. This is a potential fire hazard and requires rectification. Mr Inspector, a qualified building inspector in Melbourne, took this photograph during a recent Building Inspection in Moorabbin and shows a potential safety hazard. It shows extensive rust in the mains wiring bracket. Mr Inspectors opinion was to replace the bracket as, if this snaps in the future someone may be electrocuted. A licensed electrician would need to be engaged to assess. The importance of obtaining a building inspection service with a professional and thorough building inspector is essential.